Corey Hoffstein of Newfound Research recently wrote an article called, “Fragility Case Study: Dual Momentum GEM.” Corey starts out saying my dual momentum approach is the strategy he sees implemented the most among do-it-yourself tactical investors. Corey then said several investors bemoaned that GEM kept them invested in the stock market during the last quarter of 2018. It signaled them out of the S&P 500 at the beginning of January after the market was in a drawdown. This caused them to no longer follow the GEM signals as given. Corey’s solution is to advocate the use of multiple lookback periods to reduce the chance of “bad luck.” He showed the performance of seven monthly lookback periods ranging from 6 to 12 months. He presented a composite of those lookbacks that create seven different GEM models instead of the usual one with a 12-month lookback. This may be true over the short-run. You cannot expect poor recent performance to be immediately followed by good performance. (We will ignore the fact that stocks are short-term mean reverting.) But neither can you expect poor performance to follow poor performance. 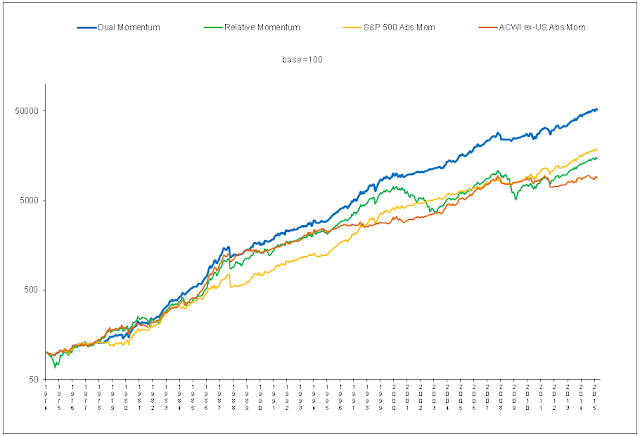 Each monthly return from momentum investing is independent but with a positive expected value. Otherwise, you would not do momentum investing. Say you flip a coin three times, and it comes up heads every time. You cannot say what the outcome will be over the next 3 tosses since they are independent. But the law of large numbers says that over time your results will approach 50/50. As you accumulate more coin tosses, your results should converge to the 50/50 expected value of each coin toss. Let us say you want heads to appear and you have a fair coin with a 50/50 chance of heads coming up. You have another coin that has a 60% chance of heads coming up. You would always want to use the second coin. This is true even though your short-term results might seem random. You wouldn’t split your wagers between the two coins. You would choose the one that gives the best expected results. The same is true with investing. If you have an expected edge from a particular strategy, you should favor that strategy. You might be able to smooth short-term volatility some by using multiple lookback models, but at what opportunity cost? Betting red and black simultaneously in roulette will dramatically reduce your variability, but it is not a smart bet. You need to consider expected value as well as diversification. The crux of Corey’s argument is that all lookbacks are equal, and any differences among them are statistical noise. So you might as well pool them together and exploit the perceived benefits of diversification. But Corey bases this on only 10 years of past data. The less data you use, the less chance you have of showig statistical significance. For properly determining statistical significance you should use as much data as possible. Corey has access to the same data I do and could have used it for his statistical tests. One has to wonder why he did not do so. One also needs to wonder why Corey choose a range of lookbacks from 6 to 12 months. He could have chosen a range starting from 3 months which also comes up in momentum studies. Corey's selection bias here further weakens his statistical inferences. Even if you have plenty of data, it may still be difficult to find statistical significance when comparing Sharpe ratios. This is due to their weak adherence to the usual statistical assumptions. If you are going to compare Sharpe ratios, you should at least use robust estimation methods. But these often produce wide confidence intervals. Not seeing significance could also be due to the low power of these kind of tests. With these, you should also be looking at independent data sets. Corey's seven lookbacks are not independent. They are highly correlated which further invalidates tests of their statistical significance. Corey also introduces bias by using an equally allocated range of lookbacks. The percentage difference between 6 and 7 is greater than the percentage difference between 11 and 12. This means there will be a greater range of results in the lower lookback periods that will cause overweighting in their direction. On a practical front, of the seven lookback periods Corey used, only the 10-month one would have gotten you out of the S&P 500 before the December loss. The 8 and 9-month lookbacks would have kept you in then and caused you to miss out on profits in November. The other 3 months would have given the same results as the 12 month lookback. During the last quarter of the year, the 12-month lookback model was down the same amount as the S&P index, 13.6%. With Corey's 7 lookbacks, you would have been down 12.3%. There would have been little difference in the outcome between using one or seven lookback models. To better answer the question if a 12-month lookback is desireable, let us look at the evidence. A 12-month lookback with U.S. stocks was first presented by Cowles & Jones in 1937. They tabulated the performance of all NYSE stocks from 1920 through 1935. After examining the data, they concluded stocks that performed better the past 12-months also outperformed the following year. The 12-month lookback they identified has held up well in and out of sample going forward and backwards in time since 1937. Jegadeesh (1990) in "Evidence of Predictable Bahavior of Security Returns" showed that the 12-month serial correlation in stocks was particularly strong compared to other months. Greyserman & Kaminski (2014) showed that long/short absolute momentum with a 12-month lookback beat buy-and-hold back to the beginning of stock trading in the 1600s. It did better in all markets back to the year 1223! I do not see how anyone can look at these studies and say, as some do, that momentum with a 12-month lookback is just good luck. The first rigorous comparison of lookback periods was in Jegadeesh & Titman’s (1993) seminal momentum paper. They compared 3, 6, 9, and 12-month formation (lookback) and holding periods on U.S. stocks from 1965 through 1989. We see an improvement in return and t-stats as we go from a 3 to a 12-month lookback period. Not only does a 12-month lookback show the best performance. The continuity in improvement as we extend the lookback period from 3 to 12-months supports the robustness of the 12-month lookback period. Absolute (time series) momentum applied to multiple markets from 1985 through 2009 also showed a steady improvement in t-stats as the lookback period increased from 6 to 12 months. A 12-month lookback comes closest to that old Wall Street adage, "More money is made by sitting than by trading." A 12-month lookback kept one in stocks longer than any other lookback. Over these 68 years, it outperformed all the shorter lookbacks in CAGR, Sharpe ratio, and worst drawdown. It gave an increase of 120 basis points in annual return over the composite of lookback periods and gave the highest terminal wealth. The fact that 12-months also also outperformed with stocks in Jegadeesh & Titman's study of stocks and in in the Marowitz et al. study of 58 futures markets is also evidence of its robustness. The 12-month and composite lookbacks had the same Sharpe ratio and worst month-end drawdown here. Corey also showed a higher return and equal Sharpe ratio from a 12-month lookback compared to a composite of seven lookbacks over the short 10-year period he examined. So why not sacrifice 120 basis points in past annual return and use the composite since the Sharpe ratios and drawdowns are the same and short-term volatility is less? There are a several reasons why you may not want to do that. First is the added complexity from multiple models. GEM was designed for public do-it-youself investors as something easy to understand and implement. It's hard to imagine public investors wanting to run seven or even four dual momentum models every month. Next, there are 35% more trades for the composite of four lookbacks in GEM. Shorter lookbacks are less stable than longer ones and may be more susceptible to losses in choppy markets. A 12-month lookback with fewer trades is also more tax efficient. With a 12-month lookback, around 70% of GEM trades would have given long-term capital gains. This would change with shorter lookback periods. In addition, a 12-month lookback has no seasonality bias. Outside diversification can reduce the impact of specification risk without harming the expected value of an investment model. Those wanting to reduce short-term volatility of GEM can add a modest allocation to stocks, bonds and/or other assets instead of using multiple lookbacks. Here is the composite lookback model compared to simple GEM with a 10% allocation to 5-year bonds. It is in line with Warren Buffett's investment instructions for his estate: 90% S&P index fund and 10% short-term bonds. Results from adding bonds are better and provide more diversification than using correlated model lookbacks. It is also a more flexible approach. Conservative investors could alter the 90/10 ratio to suit their own risk preferences. In my book I show a 70% allocation to GEM and a 30% allocation to bonds for more conservative investors who want less short-term variability. Allocating to a different asset can reduce style and timing risks, as well as specification risk. GEM was introduced as a way for do-it-yourself investors to use dual momentum. It is much easier to use one rather than seven different lookback models as Corey suggests. No one can say with certainty what the future will be. Process diversification can be beneficial if it is done selectively. Corey is correct in saying specification risk exists, and it can be reduced by using mutiple lookback models. But there are other ways, such as outside diversification, to reduce specification and other risks. I use multiple lookbacks myself in the proprietary dual momentum models I license to investment advisors. But I do not indiscriminately combine them. I found I can enhance performance by using criteria in addition to time in selecting lookback periods. I also succesfully apply dual momentum to the bond market with my proprietary models and use different lookback periods there. To me, the most interesting idea in Corey’s article was that some investors and advisors overreact to short-term performance. Trend following models will never sell at the top nor buy at the bottom. They do not have to for investors to do well. There will always be noise and tracking error whether you have one or a dozen lookback models. The real fragility is with investors who misperceive the normal volatility you should expect from momentum investing. If you change or abandon a model whenever it has losing trades, you are less likely to succeed at quantitative investing. 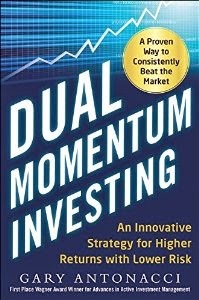 Dual momentum investors need a good understanding of the process and the research supporting it. This can help them keep the big picture in mind.